Global Tamil Forum (GTF) has today called for victim-centric actions in coordination with UNHRC to ensure successful Transitional Justice process in Sri Lanka. Very Good! Main objective of Tamil terrorism was to kill personnel of SL Armed Forces and Sinhala civilians. They went on with the killing spree for nearly four decades. 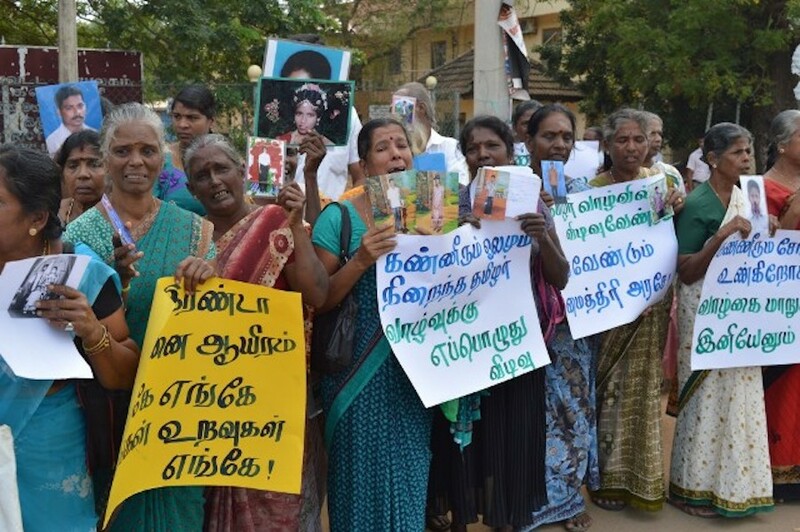 As such the majority of the victims of Tamil terrorism were Sinhalayo. If there are people in UNHRC with something called brain inside their heads should focus on Sinhala victims under the victim-centric action program. Be honest Octagenarian Mahinda Pala !. If we are honest WE PERFECTLY know our leaders would never GIVE the priority for victim-centric investigation. They have sofar treated them with lukewarm arguments. We cant GO on SHOOTING the messenger forever. You will die in a couple of months but our people should be well aware of the fact that LAW and ORDER should e placed above in a society so that the justice is safeguarded … so long we beat around the bush, nothing will work for the healing process of victimized families. Be them with NOTHERNERS of SOURTHENERS … this will be the reality. Leaving war crime investigations, why not President Sirisena SPEED up post war crimes in the country. Human losses, drug related mafia, money laundering acts deliberately carried out by BP Rajakshes should NOT be forgotten by anyone in this country. Which reminds me of Punnak eating Frogs in wells of Srilanka similar to your brain comes to my mind. Hop Hop from well to well , No need of grey matter at all just CROAK!!!! Have you ever had chance to breathe fresh air? Try, you will feel good. You do not have any obligation to let HLD M sit on your head. That must be suffocating for you. Why do you tolerate and accommodate the old racist. Aging didn’t make him kinder nor wiser. Poor man. You should pull your head wherever it is now. Get real, and stop treating all Tamils as terrorists. There are grieving mothers and family members desperate to know what happened to their loved ones, and the government owes them an explanation, and they need justice. This is not a democracy otherwise. People who keep excusing the Rajapaksa’s don’t care, it was not their loved ones that are missing. Until there is accountability, expect international agencies to demand answers. We depend on foreign aid, and cannot show our arrogance to the hands that feed us. Do we need rocket scientists to find out the truth about what happened? Megalomaniac Prabhakaran got inspired to launch the 18th Dravidian invasion to colonize Sinhale with the backing of Hindia. Following the same pattern of the previous 17 Dravidian invasions Demala barbarians started ethnic cleansing by killing Sinhalayo in North and East. After that they terrorized the whole country using suicide bombers and claymore bombs. 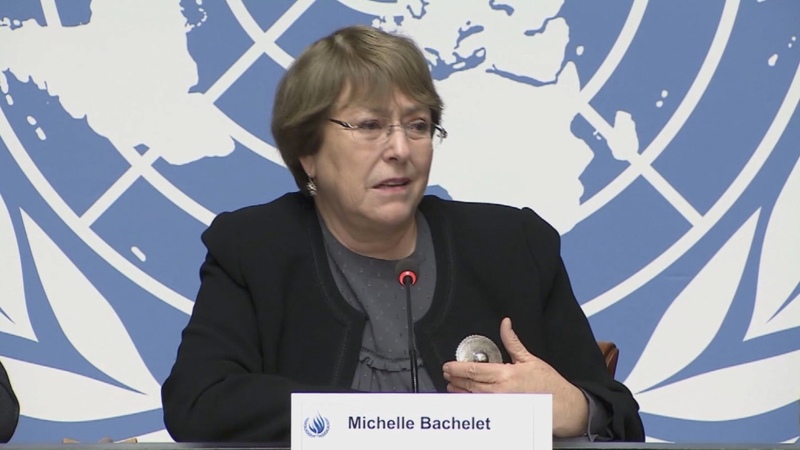 High Commissioner Bachelet this is the truth. Do not waste money of tax payers who support UN. Can waste lot of resources in the name of Transitional Justice and Reconciliation (beneficiaries are Choura Regina, TNA politicians and NGOs), but the conflict in one form or another will continue as long as racist Wellala elite politicians are there. Their political survival depends on depicting Sinhalayo as the arch enemy of Demala people and they are the saviors. On the day that ordinary Demala people realize this and say no to this Wellala racist politicians Sinhalayo and Demalu (Hindu and Muslim) will be able to live in harmony. RIGHT MINDED INTERNATIONAL COMMUNITY: ARE YOU DEAF AND BLIND? International community should note that Sinhala people in Sri Lanka suffered for over 30 years due to death, destruction, terror and conflict brought about by Tamil terrorists. When Tamil terrorists committed most heinous crimes against Sinhala people neither the United Nations Human Rights Cesspool nor the International Community condemned those crimes and made an effort to stop the terrorists. Instead of condemning terrorism, some so called ‘Civilized Countries’ in the Western world tacitly supported terrorists displaying their hypocritical nature. The Sri Lankan Armed Forces crushed this Tamil terrorist outfit and brought peace but unfortunately some of these so called ‘Civilized Countries’ have framed war crimes charges against Sri Lankan Armed Forces through United Nations Human Rights Cesspool. They have completely ignored the fact that it was Tamil terrorists who committed most heinous war crimes and crimes against humanity. The right minded International Community should be ashamed of such unfair actions taken by UN. Good point I never knew these facts and I wrongly recognised JVP being Tamil terrorist and the state killing machine is an angel. Thanks for pointing out these finer points. These should be added Mahindawamsa. Do these terrorists want to include the 60000 Sinhala victims of mlechcha Tiger atrocities in Ampara, Gonagala, Anuradhapura, Kandy and other places too? Or are they yet to civilise to such human levels? They seem to be even worse in civilisational terms than the screaming Land Thief of Halgolla, for Jeeves’ sake. What exactly are you trying to convey? It is clear that the hat has fitted you, isn;t it Land Thief. It is clear under all of your many guises assumed under US=Canadian sponsorship of the Fifth Column, you moosalaya. Native vd what is your problem? Vd? Native ; Her frustration. Imagine being with 60,000 -two at night and two during the day. War does not come without violence. The whole country is a victim of war. So many decades, so many deaths, lots of injustice, quality of life has reduced for many. Why only worry about the final days of war only? Every one supporting and supported war in any form, are a part of the aftermath. 3 forces, given the circumstances, did a great job. Few bad apples in the bag should be thrown away, when you look at the big picture. Dead have gone, but they live inside our hearts. The justice you are seeking is actually to satisfy you. None of it will give their lives back. Only way forward is to forget and embrace each other with love. Instead we are fueling the fire with hatred our hearts are consumed by. UN always blow out of proportion when it comes to cirtain nations to help their stakeholders. Justice you seek is only fair to a few, but many will hold you responsible for the future chaos. We have been hearing the same bull since 5th April 1971. Could you kindly introduce to new kind of fresh bull. Sorry to hear about your plight. Decades of bull is making you and your environment stink. It’s time to have a bath, kindly do your self a favour and us and clean up. Therefore I want the descendants of Kallathonies like you who causes sinking BS to leave this island. Go back to your natural habitat in South India, go, go ,go …………. Guys in the ‘Koti Diaspora’ and racist Wellala politicians have a vision problem. They cannot see the picture. They see only those tiny black spots. Sri Lanka judiciary can commence by trying the more than 22 Political Prisoners jailed under the PTA by Gota for decades and show the world that justice prevails in the Dharmadwipa. Then the UNHRC may be convinced that there are Real Judges in Sri Lanka. How can GTF, TNA and others who supported the LTTE now act as innocent victims and ask for punishment of our security forces. Is the International community continued to being hoodwinked by them? By any chance you are Bull S**t Prabahan (BSP)? GTF, TNA, ….. all victims of LTTE. Hindians and Americans brought the International Community under a coalition of the willing to destroy LTTE despite heavy civilian toll. You should continue to update what has been happening in Sri Lanka and the world. You can start learning it here and now. You will learn from K A Sumanasekera , Eagle Eye, soma, Lal, sach, Taraki, Champa, wannihami, maalumiris, Punchi Point, JD, Rtd. Lt. Reginald Shamal Perera, ….. as to why Sinhala/Buddhist fascists are looking forward to mother of all riots bigger than the 1983 one. What UNHRC couldn’t do for ten years, Lasanthas daughter did in noe day. Shame on UN. Emmanuel, Surendiran & the GTF must mind their own business close to UK. Suddenly, GTF, Emmanuel, TNA, Surendiran have turned out to be Human Rights activists shedding crocodile tears. All of them have blood on their hands of the innocent Tamil Youth & Children of the North. They shattered their dreams and that of their parents and destroyed the future generation as they belong to a lower caste. Monetary gains & housing and other luxuries can not compensate the loss of life and lives robbed. UNHRC is a decoy to divert the attention of Sri lanka. UNHRC. LTTE RUMP living overseas is the puppet used for that. What the INTERNATIONAL COMMUNITY aka “USA doing with UNHRC is finishing of implementation of the NEo-liberal program and Promoting Sri lanka against China to go to war in Indian OCean. It is just Jealousy and Hatred. that is why Sri lanka needs a fidel Castro or a Duterte. Ranil and Mahinda Rajapakse are joking and fooling voters. Maithripala sirisena is not that far. The case against Gota by the colonial left over Burgher ghetto group is a non event. ‘Legally valid Summons’ in the US are handed over by Sheriffs and no one is obliged to accept a private citizen’s Burgher summons. The Burghers including the stupid Land Thief at Halgolla need to realise that there is no salvation for the dead fool until his Burgher and overseas cult connections are revealed. Blind Eagle Eye, Who is responsible for the murder of Lasantha Wickremathunge? Prabhakaran? Did Suren Surendran say that the UN Judges should be Victim Centric?. But Isn’t this UN Resolution which the UNP , US and UK formulated and Mr Mangala sponsored specifically refers to War Crimes committed in 2009, when Mr Pirahaparan was holed up in the Bunker in Nanthikdal, with his front line Commanders setting up Forward Defence Lines in Pudithikuruppu to the North, Killinochchi to the South and Colonel Soosai on the Mulivaikal Beach? Anyway if Suren sent that USD4 Billion to Mr Mangala by EFT, the other issues that the Partner of Suren in Srilanka the TNA party boss Mr Sampathar has been raising recently wouldn’t have been there. Mr Sampahar’s recent plea to the UNP boss Dr Ranil is really heart breaking. Mr Sampthar says 80,000 War widows, 12,000 Rehabilitated LTTE Cadres , and Tens of Thousands of LTTE supporters are doing it tough. And Mr Sampathar is asking only LKR 24 Billion. Just put the things in perspective , Suren’s USD 4 Billion is now nearly 200 Billion Rupiah. Even if Suren sent half, it would have been 100 Billion Ruppiah which is 4 times which Mr Sampathar has asked from Dr Ranil. 100 Billion Ruppiah would have supplied proper Brick Houses to all the War Widows and the Thousands of LTTE supporters who don’t have a roof over the head. And given Low Doc, Low Interest or even Interest free Loans to Farmers and Fisher Folks whom Mr Sampathar has mentioned. I know that AAVA Dude who chatted with Chatura on Derana recently, reeled off a real long list of urgent needs of the underprivileged inhabitants on their Territory who were affected by Mr Pirahaparan’s activities. Finally it looks like you are coming around to humane way of thinking, out of the Sinhala/Buddhist box. Does it also include areas affected by incidents of 1956, 1958, 1961, 1971, 1977, between 1987 and 1991, …. 30 years to 2009, …………………. ? But the UN Resolution is totally devoted to try the War Criminals in Nanthikal in 2009?. Have you read the fine print , Mate..
BTW, What do you think of that AAVA dude?.. Don’t you think he is the Real Deal when it comes to giving Pirahaparan’s Victims a fair go with their pressing needs?. Wonder how much of that 90 % of the Land Holdings , which Abraham said the TNA has received so far gone to House the War Widows and rehabilitated Pirahaparan’s Cadres?…. You should aim this question at Gota and the Military Intelligence. Man you are really determined to take this island to the bottom. Before independence in 1948, the founders of Ceylon (now SL) felt the McCarty-urge to dilute the democratic power of non-Sinhala speakers, For all practical purposes, Tamil speaking minorities were relegated to second class citizens. Successive GoSL adopted, or had to adopt, this policy. We are where we are because of this. To heave a sigh of relief! Finally, Sri Lanka can divert all the charges to India because it’s India that created all this separatist war in Sri Lanka in order to have it in their grip. Thanks for the idea “Victim centric Actions”. GFT is/was that LTTE Terror out-fit of that another arm of Tamil Eealm project funded by Western Capitalist of USA, UK some EU countries like Germany France Swiss Canada and Australia are key backers of Tamil terrorism . No doubt it is extrema an Organization of separatism for Tamils. It is not confined to Tamils in lanka that is for the Tamil speaking people in out of Tamil Nadu. GFT playing new arm of advocated for Tamil Eealm. GFT is working out-right for promoted Tamil Terrorist in Globally . Key persons are behind by Tamil diaspore ! There many who opposes LTTE, Tamils, Tamil Diaspora, Democracy, Muslims, NGOs, ……………. too would like to have/receive a contribution from “Western Capitalist of USA, UK some EU countries like Germany France Swiss Canada and Australia”. Therefore could you let them know how, where and when to contact these western countries so that they could fit themselves into western secret agenda as you suggest. Hell with the country, as Gota, Basil, ……Sarath and few others are US citizens/green card holders, …………..
We are try to seek truth out of victims of by the UNO that system of majority People of Sinhalese-Buddhist that Sri lankan had been suppressed by so-called UNHRC and other UNO that agencies. The one of that is the current UNO and its agencies like mind UNHRC and; others by for Western nation like UK, USA Germany France Canada, Swiss and Australia. on issues of “War Crime” an advocated by TNA of armed wing of that London base GTF. An According to that Tamil version LTTE was NOT that “Tamil Terrorist”, they seems to be “Liberation Fighter ” for the Global Tamil Race for ,who are living out that of Tamil Nadu in Republic of India. On going of Tamil-power grid of current TNA GFT and World Tamil Congress, The exile Tamil Transnational Govt. base in USA are receiving massive pipe-line of funds raise by many so-called Western Democracies developed nations of by Tamil citizens! These is where that root of cause remedies arise that Sri lankan nation has been victims of that blame & claim by TNA of Tamil Terrorist of that One of Oldest democratic country in post-independent World of after that Second World War 1945. She( Sri lanka) has been name as “War criminal” by Tamil Terrorist of locally led by TNA of leader of R.Samapatahn of also hidden leader of LTTE. Our sovereignty has been permitted and having every right safeguard nation democratic system of governance from by extermisim of that Global Tamil Terrorism. In the after 1948 Independent we are majority People rely of Democracy not that Gun Rule politics uphold by TNA-of GTF.